The use of HBM for fluvial and marine construction works developed in the US. This experience commenced in the early 1950s when during the construction of several major earth dams in the central plains area of the US, the Bureau of Reclamation (the Bureau) became concerned with the high cost of providing quality rock rip-rap for upstream slope protection of these dams. The Bureau therefore initiated research to study the suitability of soil cement for this purpose. Based on laboratory studies that indicated soil cement made from sandy soils could produce a durable, erosion-resistant facing, the Bureau constructed a full-scale field trial section in 1951 on the south shore of Bonny reservoir in eastern Colorado. The particular location was selected so that the trial would be subject to severe conditions of waves, ice and an average of 140 freeze-thaw cycles per year. The trials consisted of stair-stepped horizontal layers of compacted soil cement facing. Each layer was 2.13m wide and 150mm thick after compaction and was constructed using the mix-in-place method of construction. This produced a minimum thickness of soil cement normal to the slope of 0.82m for the 105m long trial sections. Two types of local sandy soils were used. A silty fine sand which required 12% cement and a silty, fine to medium, sand, which required 10% cement, both by volume. The average 28-day strengths were 7.9 and 6.1 MPa respectively. After 10 years, cores revealed that the strengths had doubled. Although the construction plant would be considered quite crude by today’s standards, the test section performed much better than anticipated with only minor erosion limited to the poorly compacted feathered edges of the layers and the lower layers where the mixing process produced less than the specified cement contents. 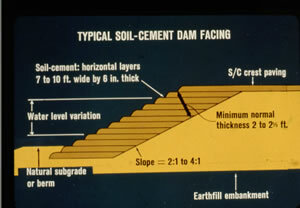 After 10 years of observing the trial, the Bureau was convinced of its suitability and specified soil cement as an alternative to rock rip-rap for slope protection of the Merritt Dam (Nebraska) and the Cheney Dam (Kansas) in 1961. Soil cement was bid at 50% of the cost of rip-rap and saved $1 million for the 2 projects. 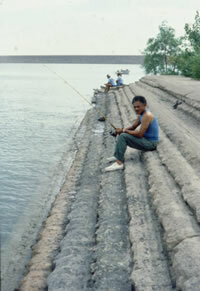 In 1963, the Ute Dam (New Mexico) became the first major earth dam with soil cement upstream protection. and low permeability liners for water-storage reservoirs, waste-water treatment lagoons, sludge-drying beds, ash-settling ponds and solid-waste landfills including certain hazardous wastes. Application and experience is not limited to the US. The technique of HBM for marine and fluvial construction works, has spread to the rest of the world including all the major land masses of America, Europe, Australasia, Asia and Africa. Control and testing of construction.